Which is better for inflatable boats -welding or bonding? For the manufacturers of inflatable boats the best method of joining materials, plastic-coated, is welding. Despite the statements found in the literature on this subject, welded joints with hot air no less durable than glued. In some cases, welded joints are better keeping the air. Today, most manufacturers of inflatable boats have welded seams of their boats with hot air. Contrary to the opinion of the author's article below, the boat does not become cheaper, probably because of the high cost of equipment. Although the fact that their quality and reliability have become higher, without a doubt. All materials of construction for inflatable boats, are flexible plastics. Sometimes it's just thermoplastics, while others - heat shrink plastic. Can be found on the inner surfaces are not smooth plastic and woven material, which, of course, and he is the polymer. Polyester (the most commonly used plastic as a base of woven material) is a heat-shrink plastic, and almost no stretch. Nylon, which is often used as a basis for the manufacture of PVC-coated materials, is also a heat-shrink plastic and stretches much better. Shrink plastic, used for coating woven fabric base - hipalon or neoprene. Hipalon can be welded, if the coating hipalonom very fresh. Hipalon hardens over time, so it is not possible to weld a couple of hours or days from the date of manufacture of the material. There are special methods of "welding" of the roofing hipalona of any age. Correct to say that hipalon - it is thermoplastic, which eventually turns into a shrink plastic. In the process of welding with hot air plastic covering material settles and is connected to another plastic. The word "plastic" refers to the properties of the material. First of all, this is a high plasticity, ie a continuous deformability under load. This is the main feature characterizing the plastic. Thermoplastics are deformed under a load greater than the shrink plastic. In fact, this is not applicable to materials where the plastic act merely as a covering of tissue basis. On the other hand, the coating determines the basic properties of the deformability of woven base. Nylon (thermoplastic) more stretched, and in it while there are higher shear stresses. Polyester (shrink plastic) stretches less, and therefore does not require as much pump boat to give it the desired shape. The quantity appearing in the material shear stress determines the strength of the woven fabric and the foundation. Therefore, polyester fabrics can actually withstand large shear stresses, rather than woven nylon material. Over the past five years, technology of the plastic coating on a woven base has improved significantly. Most thermoplastics are to have better adhesion properties with respect to the fabric-based than the shrink plastic. Modern Thermoplastics penetrate into all pores of woven material before solidification of the plastic coating. These coatings provide the best sealing and adhesion. As a result, all the problems with integrity and adhesion disappear by themselves. Currently, welding materials, plastic-lined, there are two main ways: ultrasonic welding and hot air welding. In both cases, the material is heated so that he could have been welded together. In addition, both processes welded materials are subjected to pressure, which improves the efficiency of welding. Therefore, thermoplastics can be welded simultaneously heated and pressurized. The melting points of all the plastics are different. Therefore, dissimilar materials cannot be practically cured. Ultrasonic welding is carried out under pressure, which are held together by two welded surfaces over a large area. Press compresses the two surfaces to be welded until the press plate closed. Then the ultrasonic radiation can pass through the small distance between the stove and bench press. Microwaves heat the material and the connection of pressure and heat fused into a whole separate layers of material. Ultrasonic welding is fast. Best of all, this is obtained by welding is not reinforced plastic (vinyl or urethane, if they are not printed on fabric), represented by a single type. Due to the presence of woven material foundations in layered materials for ultrasonic welding of boats every time gives different results. All manufacturers of inflatable boats that collided. Remember that plastics do not conduct electricity, but because ultrasonic welding for joining thermoplastics is only applicable under certain conditions. Hot air welding uses a method of heating the plastic cover at points of contact of different materials. The method involves welding broach the layers of material to be welded through the machine, and in the place of contact between the layers of the material is fed hot air. Pressure from the rollers, which extends through the material, combined with the heat from the air combine layers of plastic into a homogeneous mass. 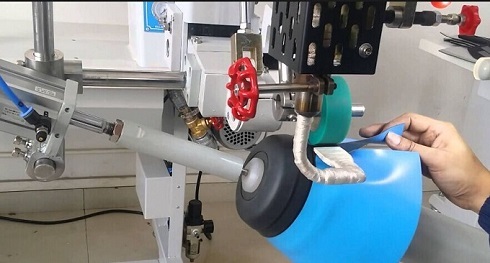 Because of the way pulling the material through the rollers in such a way can be welded sections of materials of very different shapes to create a variety of inflatable boats hull. In addition, it is a very fast way of welding, devoid of drawbacks of ultrasound. However, here are the rules and regulations. Commonly used method of manual welding with hot air to achieve the results that other manufacturers are seeking by ultrasonic welding. Manual welding allows accurate to the process of connecting joints. Bonding process consists of preparation, adhesive application and combination of materials together. There are in the process of bonding two components, which are more expensive the whole process because of the extra work on their execution. The quality of adhesion is determined by the quality of surface preparation for bonding, strength of the material and the environment, which also strongly influences the bonding. Portions of the product can be prepared for a uniform process and then immediately execute all uniform operation. The longest is the preparation. Here, the most common errors occur and how to prepare surfaces for bonding, and in applying the adhesive composition. This is the main reason for the high cost of laminated products. It is understood that the smaller manufacturing operations, the lower the risk of human error. Typically, hot-air bonding is primarily used for bonding components of inflatable boats that require an air tightness. If the bonding would be a mistake, then correct it would be impossible, which is especially important for the balloons inflatable boat. At the same time, not all nodes can be connected and to provide for curing this functional aesthetic connections. Vulcanization is much closer links (combines) the joined materials, the adhesion is considerably higher than for bonding, this method is best suited for the manufacture of inflatable boats. This saves the properties and characteristics of the original material, and the presence of connecting material (adhesive layer) does not weaken the connection. Add the cost of glue and works on his application and it will become clear that the cure not only provides better quality, but by itself costs the manufacturer less.